With injection molding and machine using both are indispensable. The operation of mold injection is actually accomplished by operating the injection molding machine. 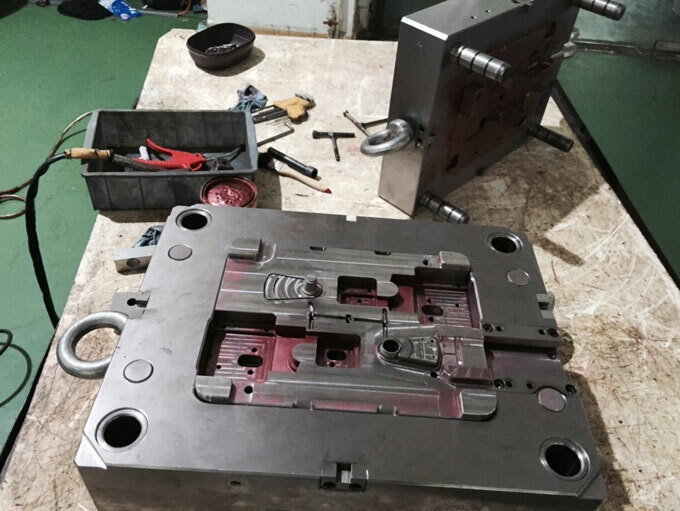 The correct use and maintenance of the mold is an important factor in ensuring the continuous production of high quality plastic products and extending the life of the mold injection molding. Using and carefully maintaining injection molding correctly is of great importance to maintaining normal production and improving company benefits. Then pay attention to several aspects. In the mold opening or closing process of the injection molding, the speed change is based on the “slow-fast-slow” three speed steps. In the process of closing the mold, to ensure that the template can move without creeping, the pressure of the system that moves the mold before the mold is injected is minimized. In normal production, it is gradually adjusted from low too high in actual injection as the case may be, and in the case of ensuring that plastic products meet the quality requirements, a low clamping force is used as much as possible. 2.The plastic products that are generally simple and have a small depth can be set to be launched once, and plastic products that are complex and deep can be set twice or even three times. 3.The speed of introduction is related to the plastic raw materials, the structure of plastic products and the temperature of the mold. The speed is too high and it is easy to crush the plastic products. So the adjustment should be made from low to high and the principle of not damaging the plastic products shall be adopted. The mold injection temperature is closely related to the formed material and must be strictly controlled. On the one hand, it is necessary to regularly calibrate the accuracy of the temperature control meter. On the other hand, it is necessary to observe the working status of the instrument from time to time, observe whether the cooling pipe is unblocked, and whether the status is good, so as to ensure the control accuracy of the mold temperature. According to the size of plastic products, there are three methods of automatic removal, manual removal and robot removal. However, no matter what kind of working methods of picking, it should ensure that in each work cycle and the parts and pouring system must be completely clean. Especially when the injection machine is in the fully automatic working state, it is necessary to set the “removing part” as a necessary condition for controlling the injection machine to enter the next working cycle. Otherwise, once the parts remain in the mold injection, the injection molding machine will perform the next cycle of mold clamping action, in most cases it will damage the injection molding, and even make the injection molding serious deformation and scrapped, so it must pay full attention. In production, plastic flashes, broken pieces, and material carbides are often left in the mold cavity. In this case, the mold cavity must be cleaned. So the specific operation is as follows. The maximum distance between the injections molding expenses, close the hydraulic system power supply of the molding machine mechanism, and all the power sources related to the side axis, open the security door for cleaning. Cleaning tools must be made of aluminum or copper tools. Never use hard tools such as screwdrivers, files, and wrenches to avoid damaging the surface of the cavity. Mold injection cavity surface, especially in the case of mirrors, if there is dirt clean cotton cloth wipe clean that shall not use hand rubbing. Observe whether the mold injection sequence is correct, whether the starting and stopping of the core sliding block, positioning and clamping are accurate and reliable, whether the sliding portion and the guide site of the mold injection have serious wear and bite, and whether the ejector pin or the return stroke has a card. The phenomenon of inactivity, breakage, or poor movement should be immediately shut down when the problem is found. Some materials are decomposed to generate corrosive gases due to overheating, which can cause the injection mold to rust. This usually occurs when molding is suspended. Therefore, when the molding is stopped, the mold must be cleanly wiped with a clean soft cloth, and the mold is closed to prevent corrosion caused by gas generated from other surrounding injection machines. When molding is stopped for a long time, the cavity should be wiped, sprayed with a rust inhibitor, closed to mold injection, greased, and gated. After the production of plastic products is completed, the mold injection is thoroughly cleaned, and the surface of the cavity, key dimensions, parts of the movement, and positioning are accurately and thoroughly inspected. After being intact, an anti-rust agent is applied. Follow the procedure opposite to installing the mold to remove the mold and lock it with the locking plate. Finish the various accessories that are matched with the injection molding of the mold, place it together with the injection molding of the mold, fill in the usage record of the mold injection, and inject the mold into the stock.